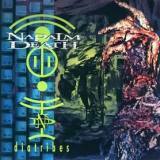 Generally considered to be the worst album in the Napalm Death catalogue, Diatribes isn’t completely without merit, but it is clearly an album from a band on the brink of falling apart – Barney left the band soon after, and if he hadn’t returned for 1997’s Inside The Torn Apart, Napalm Death may well have ceased to function. Following 1994’s excellent Fear, Emptiness, Despair the band were clearly under pressure to repeat its successes in a more commercial form, and the experimental nature of the songs and the essential Napalm Death heaviness clash constantly. Take opening burst of catchiness Greed Killing, the kind of bouncy Groove Metal song that would come to be perfected later on Words From The Exit Wound - it sounds leaden and weighed down by the Death Metal elements, Barney’s vocals are simply too heavy for this type of song. With hindsight, Greed Killing comes across as a weaker sibling to the later Breed To Breathe, a song that’s better in every way and even had its music video banned after its footage of urban violence and death proved too much for some. Here, Greed Killing is undoubtedly one of the better songs on Diatribes, which isn’t really saying much. Following song Glimpse Into Genocide has the same sort of post-F,E,D structure and an interesting sort of Industrial groove that could be mistaken for Grindcore if you’ve never heard it, but it still drags, and from then on the album, frankly, disappears up its own arse. Whether it’s the angry buzz of Ripe For The Breaking with the melodic sections interwoven with Thrashy groove and speed, or the near Nu-Metal of Cursed To Crawl with what is perhaps the oddest use of clean vocals ever, Diatribes is the sound of a band trying to be something that they’re not. It all sounds ok on a first listen, but once you’re used to the album it’s incredible how badly the various elements fit together. One highlight is Cold Forgiveness, a strangely Industrial track that takes influence from Godflesh and has some surprisingly effective clean vocals from (I assume) Barney. However, the only member of the band that really manages to rise above it all is drummer Danny Herrera, who proves himself as capable of complex tribal-esque beats as the usual freak-speed blasts and is a joy to listen to, as ever. Although there’s little that will actually make a Napalm Death fan throw up, especially one who enjoys their other 90s output, most of the songs here verge on the boring, like Just Rewards, the band aiming for a kind of ominous atmosphere and missing the mark, and Take The Strain, some form of strange Alt Rock sound coming to the fore. Unless you absolutely must own everything from the band, Diatribes is an album that can safely be missed; the albums before and after show off Napalm Death’s experimental sound much better and have more enjoyable songs. And no, I have absolutely no idea what that thing on the cover art is.